This is one of our most popular spiral stair rail systems that Stairways, Inc. manufactures. Spiral staircase is 60" in diameter and is code compliant. The spiral stair line rail system has 9 lines with less than 4" spacing between the rails. Top rail is a # 200 - 1 1/2" round tubing; intermediate rails are a 3/4" round steel solid bar; posts are 1/2" x 2" flat bar at every quarter turn of the stair; the spiral stair treads are made out of 3/16" thick smooth plate steel. 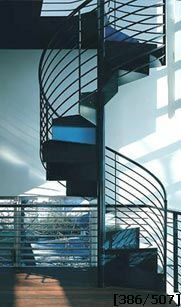 This spiral stair was manufactured with optional closed risers. The center column is made from a 3 1/2" schedule 40 I.D. pipe; and the landing (not shown) is made out of the same material as the spiral stair treads. The balcony rail is built to match the line rails used in the spiral stair. The stair was shipped in one section with a red oxide primer finish and was painted on the job site by others. Stairways, Inc. has custom capabilities. The application shown here is contemporary. This customer was looking for a design different than the house next door. We designed the spiral stair step and riser to form a single saw tooth look from top to bottom; lines are sleek, contemporary and fit the surroundings perfectly.